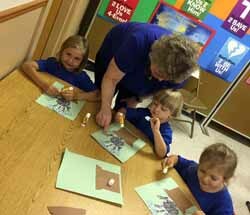 We held our Vacation Bible School this year from June 6-9 and used the SonSpark Labs program by Gospel Light. Each day the kids delved into the Bible; they learned about creation, the fall into sin, Jesus’ life and ministry, Jesus’ death and resurrection, and how to show love to others by sharing the gospel. 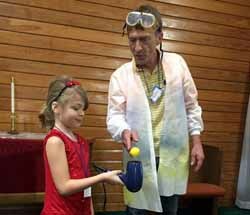 The four day program was filled with a variety of activities, including fun science experiments, crafts, games, and music. 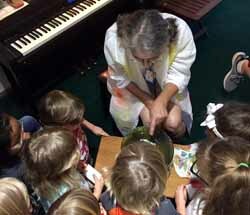 The 19 children in attendance enjoyed learning more about their Savior and discovering different connections using science principles! Thank you to everyone who helped make VBS run so smoothly. Learning about forces on objects.